The physical version of Shantae Half-Genie Hero for Nintendo Switch has arrived with the Ultimate Edition of the game. With that, it’s time for another A Look At. 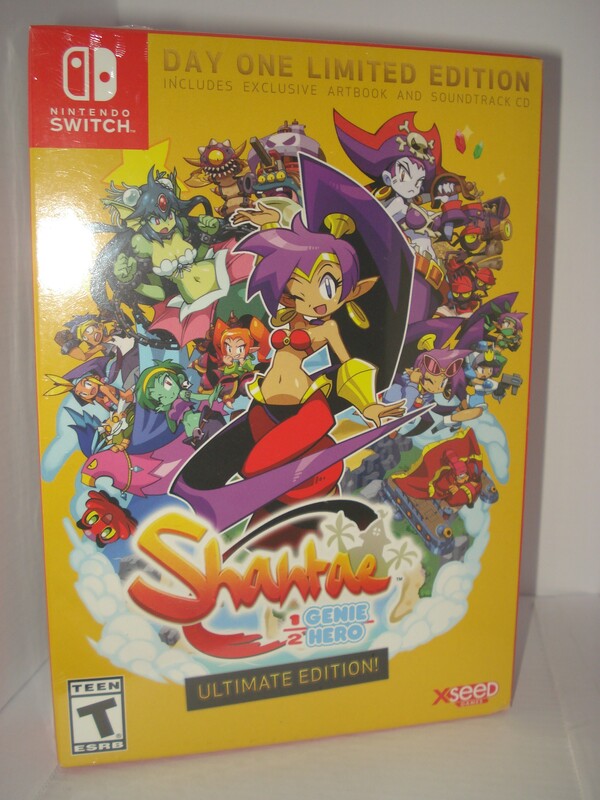 The physical version of Shantae: Half-Genie Hero Ultimate Edition for Nintendo Switch. The Risky Beats Soundtrack CD. And the back and side. Now for the inside goodies. Here’s the game itself, in it’s own nice Switch box. And on the inside, we get a nice surprise. Besides the game cart, XSeed has actually printed and included a small sized manual. Second, here’s the art book. It’s around 90 pages long so I’ve only included a few picture samples of it. The front side has a nice embossed cover. By the way, did you notice the small Shantae on the lower-right corner of each page? That’s not random. If you flip quickly through the book, you can see it animate and see Shantae dance. Finally, here’s Risky Boots CD. This bonus is exactly the same as the one that came in the previously released Risky Beats Edition for Wii U. And just in case you were curious and wanted to compare, here’s how the Risky Beats Edition pack looked like. Back and the other side. Feel free to click on a photo if you want to get a better look at any of them. And for a quick view at the game itself, you can enjoy the video below which includes gameplay of every mode with the exception of Hero and Hard.